as to why billets offer advantageous flow... it appears to me they have smaller hub area per total wheel area so they have more vane area. the GTX42 comparative compressor maps are astounding as to difference. from 74 pounds per minute to 88 at one pressure ratio of boost! 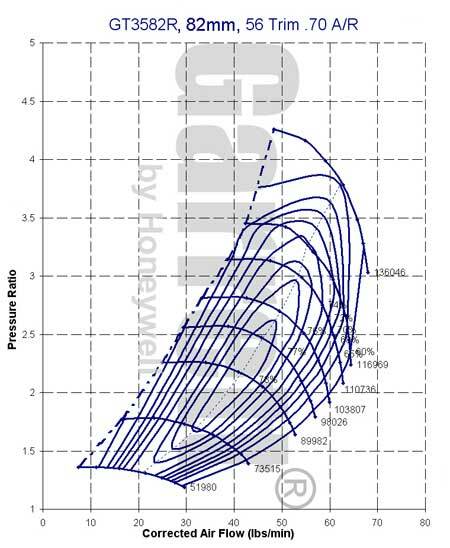 airflow is everything... take a close look at dyno charts and note the immediate relationship between boost and hp. magic. no doubt Garrett's GT35 wheel will be on the way. Last edited by Howard Coleman CPR; 03-24-10 at 09:12 AM. The comparison of a HTA35R to a 62/65 is pointless, apples to apples please, it needs to be 61/62 to HTA35R. Saying a smaller turbo comes on sooner so you get power sooner is really ground breaking news Sorry for being a smart *** couldn't resist. Honestly though they should have compared either a 61/62 or if it was a billet thing a billet 60/62 would have been a better choice. You can't compare essentially a P-trim wheel to a 35R wheel and then be surprised the 68mm turbine outspooled(sp) the 74mm turbine, especially on a 4cyl. Is the HTA wheel a good upgrade on the 35R? Sure. Last edited by Zero R; 03-24-10 at 09:30 AM. checking Garrett's site today reveals a NEW (the third) compressor map for the GT3582r and it is impressive. take a look, there is 70 pounds of air here. in rotaryland that means 527 SAE RWrotaryHP potential. it isn't all top end either. note at two pressure ratios, 14.7 psi boost, there is 4 pounds more flow. that's 30 rwhp! all the more reason to get the A-Spec "GT3574" option which has a 14% larger "P" trim turbine wheel. there may also be other sources for a similar turbo. the 70 pound output certainly gives on reason to ponder as to whether to go w the laggier 67 mm traditional wheel that makes 73 pounds at a higher boost level. Howard, first thanks for all this information. WE NEED THIS KIND OF STUFF. I was guessing at my turbo selection, now I am sure. I don't get how the ported shroud produces more power >_>. Isn't it supposed to be the opposite? I forgot about the R85. Not many people have it. The inconel wheel sounded promising but maybe it was the price that it didn't catch on? More info on "billet" please? Does it mean both wheels are from one solid chunk of aluminum? What about porting the cold side snail? I've seen that advertised lately but no dyno proof to back up the increase in hp claims. I know HKS did something similar with it's bullet holes but the one I saw looked more like the skinny part of a bridge port. one of my motors dynoed last year w an R85 and i was favorably impressed. slightly over 400 SAE rwhp at 5500 rpm! 500 boost limited at approx 20 psi. awesome. that's why one of the 4 turbos i am testing in my 4 turbo comparo is the uprated version of the R85. i want to see what it's got. does the smaller hotside REALLY make a difference? I believe, and someon correct me if I'm wrong here, but you lose a little eficiency but you gain a bit of safety and one hell of a cool sound with the ported compressor shroud. I had a 500R and got the wheel changed out with a billet. I can feel the difference and actually hear it whine down when I turn the car off! re the Garrett "Ported Shroud"
part of my 4 turbo dyno evaluation will be to dyno the 3582r w and without the ported shroud. so we will have some answers. Garrett has chosen to put a period on this thread. actually the GTX3582r is an exclaimation point! 573 rw rotary SAE hp! WOW. from a diminutive 18 pound package. 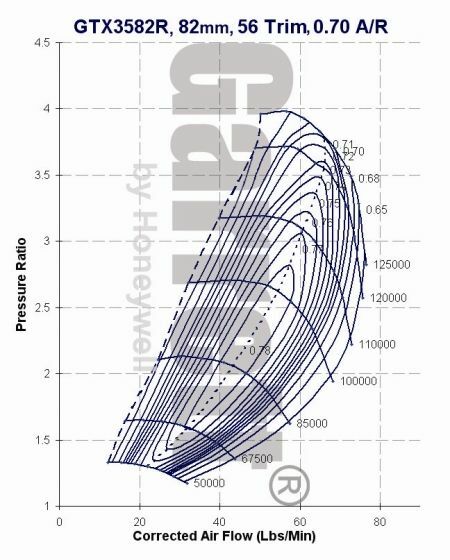 take a comparative look at the two prior GT35 compressor maps.. Post 30.
and that isn't taking into account a better efficiency ratio. we will be testing this turbo in my comparison thread in the single turbo section. if the map proves out this could be one of the first truly do it all turbo for the FD. Are the GTX series turbos have different compressor housing design? In other words for those of us who have the GT3582R can we just purchase a GTX3582r cartridge and swap it? since the X compressor wheel IS different you will not be able (even if Garrett would sell it separately) to just swap it into your compressor housing as the profile is different. compressor wheels, to be efficient, need to have very little clearance between the wheel/housing. IF you could get Garrett to sell you components, you would need a comp wheel and comp housing... then do a balance etc. 'probably be better to trade your GT35 and upgrade. most of the 67 MM turbos, TO4Z, TO4r, GT500, PT67 have really big Trims. in other words the minor diameter is closer to the major diameter. the closer the minor is to the major the less spool-midrange you have but you gain topend. the trim for the 67 class is 63.
the output for the non billet 67 is approx 73 pounds per minute. or 1056 CFM which produces 550 SAE rw rotary hp on gas w AI. the GTX3582r has a 56 trim so it will spool midrange better AND it make 76 pounds of air or 1099 CFM or 573 hp. more midrange and more topend. 2011 is going to get interesting. Last edited by Howard Coleman CPR; 12-05-10 at 07:19 AM. so the GTX35 has an awesome new compressor wheel but how about the turbo side, are there any changes? what's the backpressure and spool characteristics going to be with the GTX35? I wonder how the performance would be of this comp wheel mated to a lightweight turbo wheel (like new BW) if even possible ! you want 490 at the crank? so roughly 420 at the wheels? get the 35r.